The Village of Woodridge, Illinois is located within Cook, DuPage, and Will counties. Woodridge offers a diverse range of housing options including apartments, condos, entry-level housing, and luxury homes. Neighboring communities include Bolingbrook, Lisle, Downers Grove, Darien, Lemont, and Naperville. In 2007, Woodridge was ranked No. 61 on Money magazine’s “100 Best Places to Live”. Woodridge, Illinois is conveniently located just 25 miles west of Chicago. Woodridge is at the Crossroads of two major interstates (I-55 and I-355), providing easy access to the entire Chicagoland area. With close proximity to O’Hare International Airport, Midway Airport, and DuPage County Airport this makes Woodridge accessible nationwide. Woodridge, Illinois was incorporated in 1959. There are 13,392 total households (2010 U.S. Census) and a population of 32,971 residents (2010 U.S. Census). The median family income is $84,460 and the average age is 36.5. Average home values in Woodridge are $270,800. The average apartment rentals are $974 monthly. For additional information on Woodridge Real Estate, contact a Real Estate Broker at Wenzel Select Properties. Call (630) 430-4790. The Village of Woodridge School District 68 maintains six elementary schools; Edgewood, Willow Creek, Sipley, William F. Murphy, Meadowview, and Goodrich. Some students also attend the nearby parochial schools St. Scholastica (K-8) St. Joan of Arc (PK-8) and Benet Academy (9–12) and Montini Catholic (9–12). Woodridge is home to Jefferson Junior High School (grades 7 and 8). Woodridge residents attend high school in Downers Grove at Community High School District 99. Some students in southern Woodridge attend Lemont District 210 and Lemont High School. Additionally, Woodridge students who reside west of the DuPage River attend Naperville schools in District 203. Westwood College maintains a Woodridge campus. 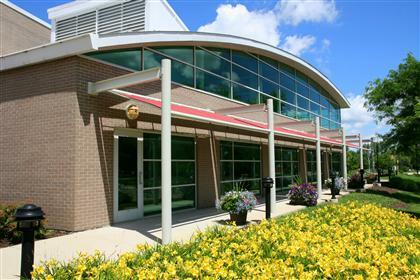 Other nearby higher education facilities include Benedictine University (Lisle), North Central College (Naperville), Lewis University (Romeoville), College of DuPage (Glen Ellyn), Joliet Junior College (Romeoville and Joliet) and University of St. Francis (Joliet). The Woodridge Public Library is located at 3 Plaza Drive. The library provides a meeting room for clubs and groups. In addition to the meeting room, there are nine smaller study rooms. Free wireless access to the internet is available to wireless device users throughout the Library. The Woodridge Public Library Gallery is located in the lobby of the Library. Monthly art exhibits by various local and regional artists provide patrons with an ever-changing selection of artworks in different media. The Woodridge Park District maintains a group of local parks offering facilities for picnicking as well as sports like baseball, basketball, tennis, soccer, cricket, and Frisbee golf. In addition to great parks and facilities offering top-notch recreational activities, there are many nearby recreational areas that offer a multitude of outdoor activities. The Woodridge Park District maintains Cypress Cove Waterpark. There is also a skate park which allows skateboarders, BMX riders, and inline skaters to skate at their own risk. A series of bike paths allow cyclists to ride through the town on paved paths. Village Greens of Woodridge is a Village-owned, 18-hole golf course; Seven Bridges is another Woodridge owned championship class course. Zigfield Troy is a 9-hole, par 3-course.